LAPD and another team protecting Chistopher Dorner's targets shoot up a newspaper deliverywoman's truck and another vehicle. Fortunately, the results were wounds rather than deaths. If highly trained police officers can't stop themselves from shooting innocents merely because they are driving a vehicle that is similar to a suspect's, obviously we can't trust civilians with guns. Looks like the pattern of buck shot and in the full photo you can see what appears to be empties on the ground by drivers door. Cops also shot up another car that day and we have yet to see proof that the ambushed cops were ambushed by the ex-cop, have we? If one retired cop, overweight and out of shape, can create this much panic, what would happen if a thousand ( or better yet ten thousand) IPSC or three-gun or even cowboy shooting competitors decided to defend their second amendment rights? Hey, LAPD...Professional much? The ONLY ONES capable enough to handle firearms...meh. It's amazing that the occupants weren't slaughtered...I don't see much coverage as to how badly they were wounded, but that's either a lot of 9 ball buckshot shells or a whole lot more sidearm rounds...or a combination of both. Compare that with the tone of moral outrage here . . .
"Of course he knows what he's doing; we trained him." - Chief Beck. So Dorner's a monster because he shoots people w/o warning. But he's highly competent because he was trained by the LAPD. Who are apparently only being competent when they empty their guns at people w/o warning. Well I guess the difference is that Dorner knew who he was shooting. The back of that pickup truck has "incompetent panic" written all over it. Then there's the other truck they shot up: "At that point, a driver in another pickup truck that look similar to Dorner's drove toward them on Flagler Lane near Beryl Street. 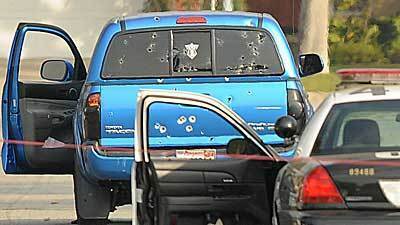 Officers, suspecting it was Dorner, purposely collided with the truck and shot at him." Why aren't the "Shooters" in jail? "John Wesley Harding was a friend to the poor and he traveled with a gun in every hand". Isn't that how the song goes. Welcome to Los Angeles, folks. This is the same Sheriff who denies us the right to carry a concealed, loaded firearm for purposes of lawful self-defense. Yet he has no qualms about giving his convicted, violent criminal nephew a gun and badge. HEADLINE: "Baca nephew is subject of inmate abuse probe"
SUBHEAD: "Justin Bravo was hired as an L.A. County deputy under a 'Friends of the Sheriff' program despite concerns about his past, including two arrests." "When Justin Bravo applied to be a Los Angeles County sheriff's deputy, background investigators noted the young man had some brushes with the law that raised red flags about his past. Nonetheless, the department hired Bravo as a deputy through a little-known program called "Friends of the Sheriff" — a screening process for applicants with connections to department officials. Bravo's link was his uncle: Sheriff Lee Baca. . . ."
So what if this guy drove a Nissan Pathfinder, which is one of the most common vehicles in America? All it took was one nut to cause discipline in the LAPD to completely collapse? Amazing. They did it again, to someone else.